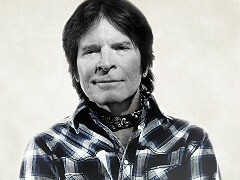 After several years of preparations, John Fogerty finally released his duets album. The collection titled "Wrote A Song For Everyone" features classical Creedance Clearwater Revival hits songs as well as newer material from Fogerty's later solo career. A number of country guests participated on this album including Alan Jackson, Keith Urban, Zac Brown, Miranda Lambert and Brad Paisley. John Fogerty paid special attention to arrangement and for instance "Proud Mary" featuring Jenifer Hudson now almost sounds like cajun while Alan Jackson's "Have You Ever Seen The Rain" with fiddle makes you feel you hear a brand new country song. The first single off the album is Fogerty's solo song "Mystic Highway"
John Fogerty - "Mystic Highway"